We have released Adium 1.5.4. 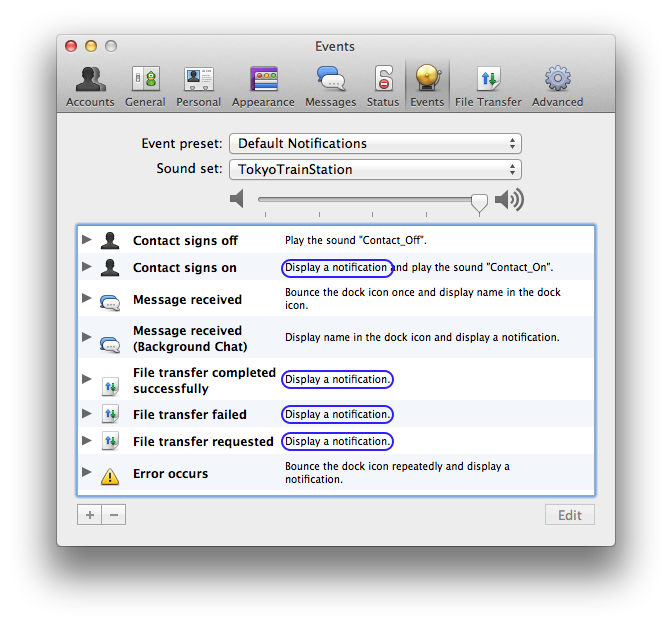 It features support for Mountain Lion’s Notification Center among other changes (full list). Growl.framework detects this state from within the app and notifications are sent directly to NC. Additionally, notification tickets are sent to Growl which performs any associated actions. Growl.app displays nothing. Growl.framework detects this state from within the app and notifications are sent directly to NC. Nothing else is done. Please note that only Growl.app version 2 or newer can be set to use Notification Center. We develop Adium under an open source license because we believe in Internet freedom. The Stop Online Piracy Act, or SOPA, is a significant threat to the future of that freedom. Although GoDaddy has officially reversed their stance on the act, we find it very concerning that it was only because of economic incentive – fleeing customers – that they now oppose it. Adium previously had two of its domains hosted via GoDaddy. As of today, these are being transferred to another registrar, gandi.net, who is donating $1 to the Electronic Frontier Foundation for each transfer. Hi, I’m Adrian, a 2007 Computer Science graduate from Europe, who currently runs a small software development company (iOS/Mac OS apps and games). I’ve been with Adium for almost 8 months now, starting from January 2011. Basically i’m working on everything I manage to grab :), things that I find interesting or easy to fix, years old tickets and even reviewing contributors patches recently, though I have to admit that my main area of interest is Adium’s UI. I hope to bring new life to Adium by working on a new “better/fresher/cooler/-insert-a-great-word-here-” UI. Other areas of interest would be: performance improvements, modern (latest) OS X tech, source code/project clean-up and lots of other interesting stuff. Developing for Adium is great, learning new stuff everyday, great team, lots of new friends ;). More about me (including contact info) on my wiki page here. Thanks! Hi. I am Patrick Steinhardt, student in Computer Science at the Free University of Berlin (Germany) and a pretty new developer of Adium. I started contributing to Adium in May 2011 with a small bug fix. It really wasn’t anything big but the warm welcome of certain people immediately convinced me to stay with Adium. Warm welcome? Yeah, I really like the friendly and occasionally engaged atmosphere surrounding our core team. I have already been given the (admittedly unofficial and not very popular) title “token master”, as I introduced the magic of token fields to our interfaces. The first and primary goal is to clean up Adium. This does not only involve the UI but especially the source code. The second goal is to get some new look to Adium but as you can imagine this is a rather big topic. Apart from those topics I am really interested in the XMPP stack with all its facilities. But I still have to find something I can work on to satisfy this passion. Hi, I’m Matthew, and while I’ve been actively involved with Adium message styles and IRC support for several years, it’s only with 1.4 that my contributions increased to the point where people starting calling me names like “developer”. You can find a bit more personal info on my team page. I’m in the process of overhauling the Message Style Creation docs, including a shiny new tutorial and pages on how to modernize existing message style to take advantage of the spiffy new features in 1.4. I’ll make another blog post when that’s complete. I am Frank Dowsett and I have been a part of Adium’s community for nearing on 4 years now. I am a Computer Science student at Trent University in Canada with a diploma in Computer Engineering. I don’t remember how I came to be involved in Adium at the start, but now I’m the one making facetious comments in IRC (as wixardy). My main goals for Adium include making the transcript viewer easier to use (i.e. more reliable, less crash-y), updating parts of Adium from 2002 to, at least, 2007 to take advantage of current technologies, and polishing Adium’s look. In my free time I really enjoy wearing my Adiumy shirts. I’m Thijs Alkemade, a 21-year-old master student in Mathematics and Computer Science at the University of Utrecht in The Netherlands. I started working on Adium in the spring of 2010. As that was the first year I had enough free time to do so, I really wanted to participate in the Google Summer of Code. Sadly, the Adium project didn’t participate that year, but rather than giving up or looking for a different project, I decided I would just work on Adium anyway! Whether you realize it or not, volunteers are the lifeblood of Adium. Every single one of us is a volunteer. All the work we do, we do for free. As such, it’s vital that we have a steady flow of willing contributors. Some of you might have noticed that we have had some new faces lately. In the next few posts, we’d like to give some of those new faces a chance to introduce themselves. They all played a part in helping to get 1.4 out the door a few months ago. Most of these guys have been around for months, if not years. Many were just fans of Adium and wanted to give back. There may be some of you out there who would like to do so as well. There’s always something to do. You don’t have to be an expert programmer to lend a hand; Even the best developer has to start somewhere. If you’d like to join our merry band of volunteers please take a look at our development page for more information. Without further ado, I’d like to present our first introduction: Thijs Alkemade. Today, we launched a new Help section on the Adium website: http://adium.im/help. You will now be able to browse the same help content available in Adium (“Adium Help” in the Help menu) right from your browser. It should cover a lot of what you need to know about using Adium. Additionally, there is a list of “hot issues” – known, commonly reported, recent problems that many people may be experiencing – for example, when a service has connectivity problems or requires you to change your settings (as was the case with Facebook Chat). We are hoping that these pages will help solve some of the most common problems that you might run into while using Adium, and allow Trac to be reserved for development and other contributions instead of support.